Here is one of ‘The Ozzy Man’s‘ latest reviews on one of the sexiest weather girls in the world. This is Yanet Garcia who does the weather in Mexico. HAHA! These guys have to be the most highly skilled, scrapping lizards I’ve ever come across! I am Not to sure what the grudge is about, but my guess would be a turf war. Someone must of been trying to sling on the wrong block. Watch as these guys take it to the streets in this UFC worthy death match. Have you ever seen a lizard try to throw another lizard under a moving bus? Well you have now, LMAO! Also The hilarious, descriptive commentary was done by the Ozzy man. A family decided to set up a hidden camera to catch Santa Claus in action to show their son on Christmas. Watch the boy’s reactions live as he watches the video for the first time. Are your Christmas funds a little tight this year? Did you wait last minute and now you have no idea what to get, because all the good present ideas that you wanted are gone… Well it’s your lucky day, here is the soulution! SNL did a funny skit about the new Star Wars The Force Awakens trailer on last night’s episode of Saturday Night Live. The video includes senior versions of Han Solo, Luke Skywalker, Princess Leia, and even R2D2. The 2nd Video is the New Star Wars the force awakens trailer released Monday October 19th 2015 during the football game. Jim Carrey hosted Saturday Night Live the other night, and this is one of the skits that they did on the show. Have you ever wondered what it would look like if Jim Carrey had a family reunion? Well here is your chance, because his whole family is here for this one. They call this ‘red neck style couch moving’ so I figured that they were just going to throw the couch out the window. But needless to say I surely was mistaken. 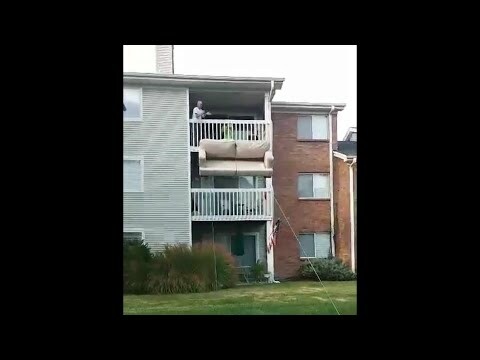 You have to watch the unique way these guys get their couch off the 3rd floor balcony of their apartment complex. Ingenious…possibly and creative I would have to say…definitely. If you watch enough videos, you will probably think that you’ve seen it all right? Well, here is a new one for the record books. Watch as Rory McIlroy hits a hole in one into a spectator’s pocket during the Par 4 – 14th hole of the 2nd round of the tour championships. That has to be a lucky ball, Rory better hold onto that one. This video footage was uploaded to the PGA Tour channel on September 12, 2014.